A business strategy that most companies use is sponsorship application Examples. It allows them to utilise the finances of others and use this material for their advantage while selling the benefit to the sponsors. 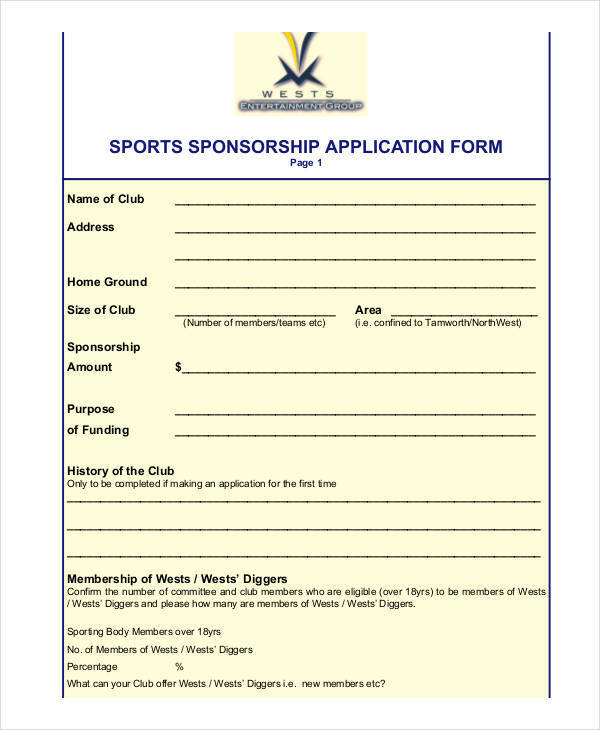 The key to get a sponsorship is by writing a good sponsorship application. You need to put a good effort just like what you do in a job application. To write a good sponsorship application, you need to have a convincing tone and a polite approach to your audience. Not only that, you also have to remember some guidelines like writing a business application. 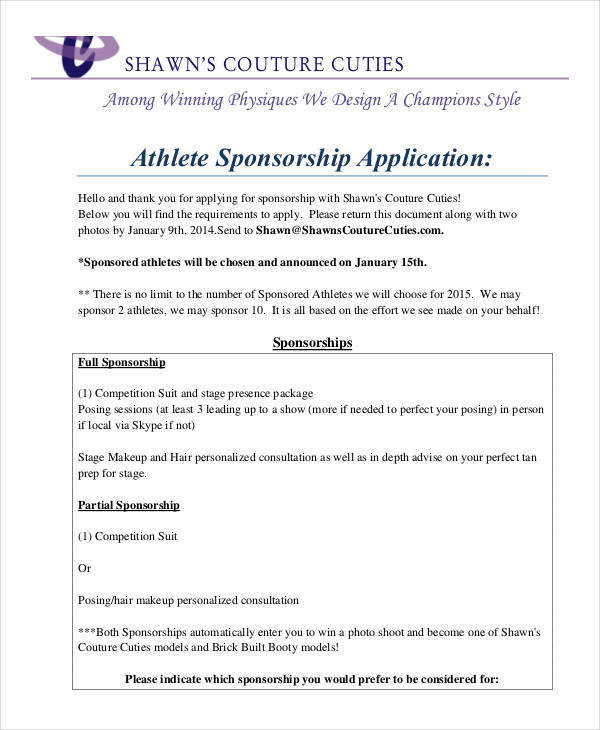 We will be discussing what a sponsorship application is and look at the different sample examples of it. 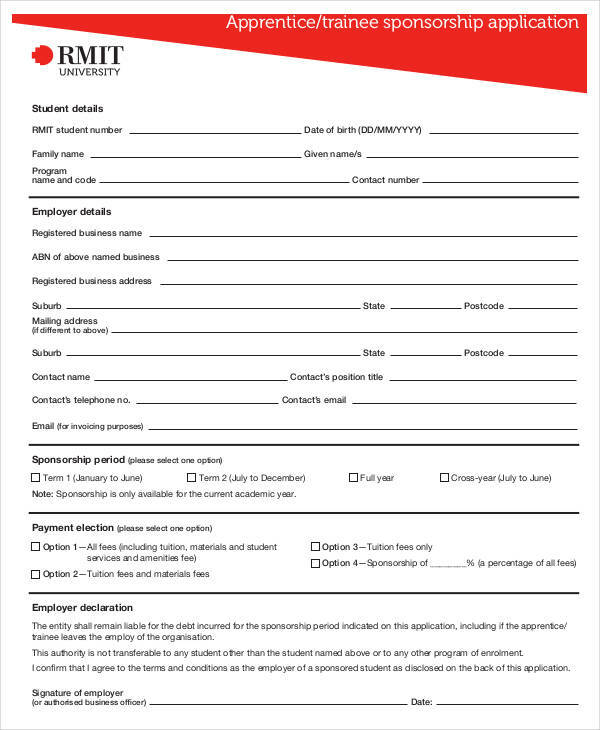 A sponsorship application is a written document that is aimed at acquiring sponsorships from organizations, corporations, and firms. 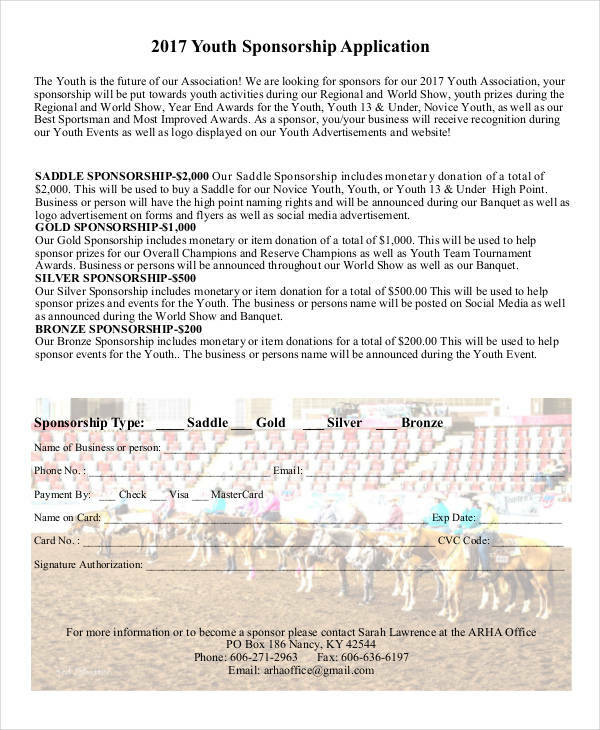 It contains information about the subject that needs sponsorship whether it be an event, corporate program, or sports activity. Just like any other types of applications, it has an aim or an objective. A sponsorship is an aid provided in a form of financing or through products and services. It is considerable business tactic as it is a win-win situation. The host of the event gets more finances or aid as well as recognition of brand for the sponsor. 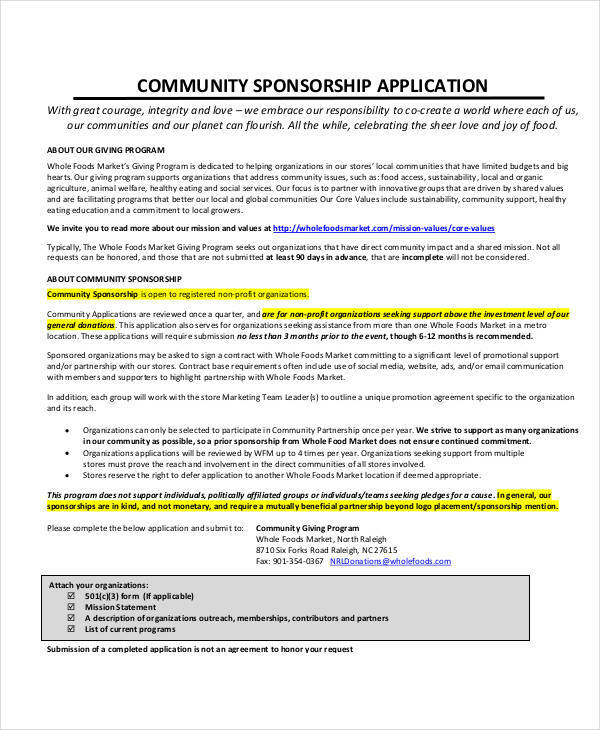 Writing a sponsorship application is the same as writing other free application examples with one unique difference. You need to sell the benefits to your recipient. Write a brief description of the event. The first part of your application should tell a story or a short narrative about the event and its purpose. Be clear with your words and make it a little lively to put more excitement to the reader. Sell the benefit. 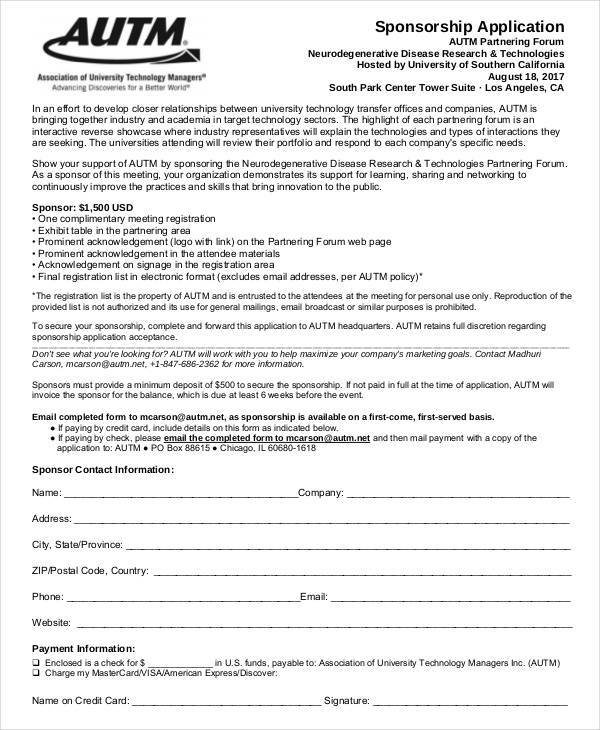 Enumerate the benefits the sponsor will get out of the event. Usually what they want to hear is brand recognition and patronage of the product so better use them. Checking a sponsorship status really depends on the effort of the event host or organizer. It is not the same as a job application where you are most likely to get a call from the company you applied for. However, there is a tip that I could share from the many experiences I had hosting organization team buildings and is most likely the most practical one. Make a phone call or pay a visit to your target sponsor. This builds more confidence and rapport with the other party plus you get the chance to personally speak with them. Among the many kinds of applications in PDF, this is probably the most common among businesses. It is because the strategy of sponsorship is practiced by almost all companies. 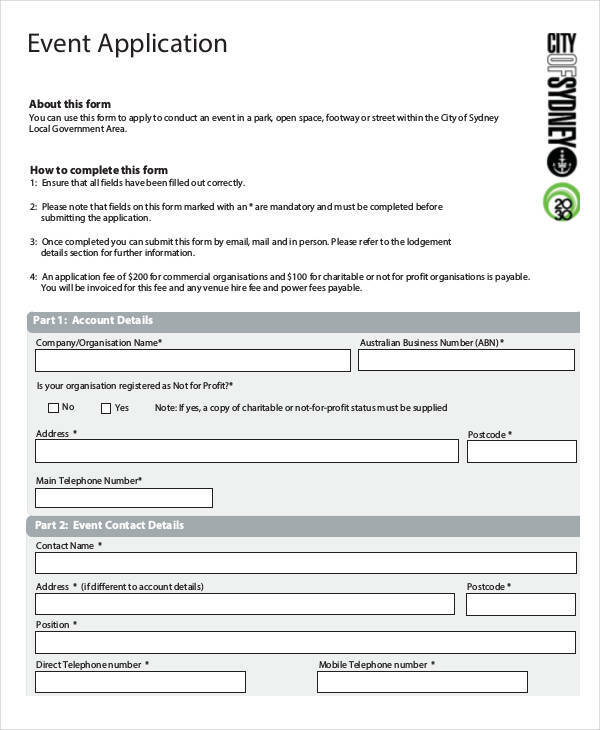 Here are some guideline for writing a sponsorship application. Use Positive Language. There is nothing more alluring than a positive and vibrant energy. Express your interest and excitement on the sponsorship. Be Personal. Never sound monotonous on your application. Be personal with your statements so that you can connect with your audience. Observe Timeliness. 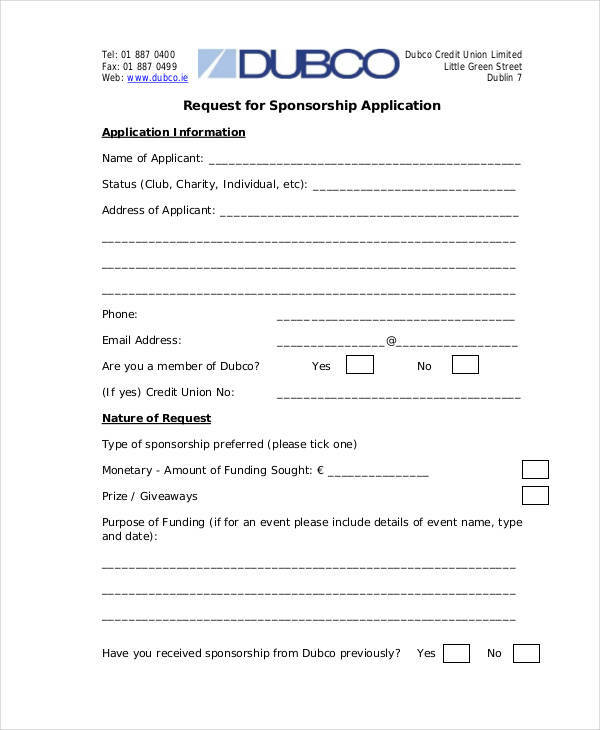 When sending your sponsorship application, make sure it’s way before the event. Allow an ample time for your target sponsors to decide on the request.